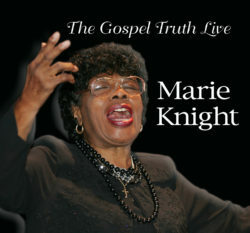 You are here: Home > Gospel Legend Marie Knight Live Recording Out Now! On October 19, 2007, they all braved the rainy weather to witness one of the last living artists from the Golden Age of Gospel (1940 – 1960). In this rootsy, organic concert, she breezed through the songbooks of Tharpe – arguably, the most influential female gospel act of the 1940s – and also the Rev. Gary Davis – who made a huge impact on the 1960s folk movement – and along the way, Knight shared brief anecdotes on the highs and lows of her earthly walk, including the fire that killed her two children and her mother. Within the span of 60 minutes, she showcased not only her thunderous contralto but also her commanding personality, sardonic humor and her unabashed evangelism. Singer/pianist Dave Keys, who has played with artists as varied as Chuck Berry and Tanya Tucker, was Knight’s sole musician for the get-together. His skillful, buoyant playing kept the spirit high even on ballads. The timing for the release of The Gospel Truth Live couldn’t be more perfect as the prestigious Rock and Roll Hall of Fame announced in December 2017 that it would be posthumously inducting Sister Rosetta Tharpe into the hallowed hall in April 2018 as an early influence on artists ranging from Elvis Presley to Bob Dylan. 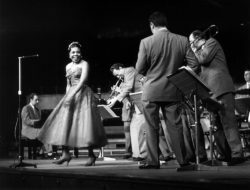 In a way, it’s also an acknowledgement for Knight’s musical contributions since she collaborated professionally and served as a confidante with Tharpe at the height of her popularity in the early 1950s. In addition two plays are currently in production about the music and relationship of Marie Knight and Sister Rosetta Tharpe. “Marie and Rosetta” is a musical that was produced by The Atlantic Theater Company in New York City. “Shout Sister Shout The Musical” debut at The Pasadena Playhouse in January of 2017. In January 2002, on a cold, bright Saturday morning, Marie entered a recording studio to pay tribute to her old singing partner, Rosetta Tharpe, doing a solo version of their old hit “Didn’t It Rain.” [Listen the fruits of that session on Shout, Sister, Shout! (MC-0050).] That session—and Marie’s continuing vitality as a singer and performer—led to her present collaboration with producer Mark Carpentieri.